The strict rule applies to talking and texting in all company buildings, including offices. Some of you may find this shocking, but there’s a cell phone epidemic that’s spreading like a virus. Actually, it could well become the zombie apocalypse we’ve anticipated for some time now. Mindless drones wandering aimlessly, completely unaware of their surroundings, crashing into things – sound familiar? Aside from eating brains, folks tethered to their phones is shockingly similar to an episode of The Walking Dead. We need a hero to lead us from the darkness, but honestly, we didn’t expect it to be General Motors. According to Fast Company, the automaker instituted a strict no-smartphone policy earlier this year when employees are out and about on foot. Such rules are a given in assembly plants, where distracted walkers could accidentally slip on a wet floor, or also get slightly decapitated by automated manufacturing robots. The new rule expands that to office buildings as well, where crowded hallways, narrow doorways, and time-sensitive elevator doors can lead to unwelcome encounters for inattentive employees. Not even CEO Mary Barra is exempt from the safety guidelines. 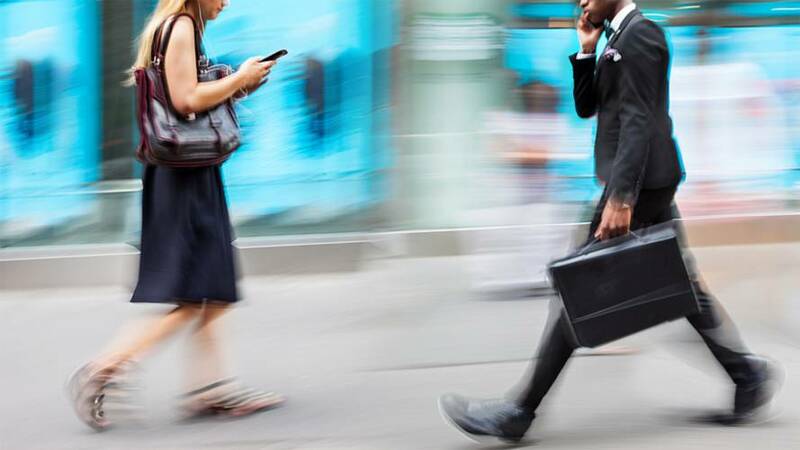 “We have asked people not to text and walk or walk and talk on phones because it takes your attention away from potential hazards,” said Jim Glynn in Fast Company’s report. Glynn is GM’s vice president of global workplace safety, and though we’ve taken a slightly humorous slant with this story, there are legitimate dangers that stem from being a distracted worker in any environment, office or otherwise. It’s no secret that people today are tied to their smartphones tighter than ever, and injuries do occur daily because people are looking at info on screens instead of looking where they’re going. It’s funny when someone awkwardly bumps into a co-worker or a wall. It’s not quite as humorous when someone slips off a ledge, or worse, walks into traffic. We applaud GM on this action, and frankly, we encourage others to put the phone down when walking. Whatever’s on that screen will still be there 20 seconds later when you reach your destination.